Following the lead of Gail at Clay and Limestone, who hosts Wildflower Wednesday on the fourth Wednesday of the month, I thought I'd review some of my posts on wildflowers over the past year. Apparently, I was too busy with winter to post about wildflowers in January but in February, I posted about my wildflowers. Or rather, I tried to post about wildflowers but the post got taken over by garden fairies, once again, and they went on and on about how you can't "own" wildflowers, just by their very nature. They also wrote that it was pathetic how little shade I had in my garden. Ha! They didn't know what "little shade" meant back in February. But they sure found out in July when the redbud that was providing the shade for my woodland wildflowers fell over. At the end of March, I was so very excited to write a post about my woodland wildflowers. They had survived being uprooted from the forest and transplanted to my garden. They are so sweet and lovely in the spring. I swore I even heard the garden fairies chanting "they survived" as though there was some doubt about that. In April, I posted about some wildflowers I purchased that were grown from Indiana seed. I considered it my solemn duty and responsibility to do so. I planted those little seedlings in the August Dreams Garden which is all about the late bloomers. Those little seedlings sure had a rough summer to establish themselves, so I'm not sure they all made it but we'll find out in the spring. Oops, I don't seem to have posted for May but in June it was all about the August Dreams Garden where the asters were blooming early. The drought had already established itself in the garden by the end of June and I think the asters and other plants decided if they didn't bloom early and set seed, then they might not bloom at all this year. They were right, in a way, because the drought continued through most of the summer. In July, still a-glow from my visit to the gardens of Elizabeth Lawrence and nearby Wing Haven, I shared more about Wing Haven. It's a lovely place and I tell everyone who plans to visit Charlotte to check it out. The wooded parts of Wing Haven are surely full of spring ephemeral flowers. Oh, I'd love to see it someday, and make a return trip to Larwrence's garden, too. In August, I turned to my August Dreams garden for inspiration and went on and on about goldenrod, and how I never figured I'd plant goldenrod in my garden. Now I have the rarest goldenrod in the world well-established and blooming in my garden. Who'd a thought that would ever happen? Not me, that's for sure. I guess it goes to show never say no and never assume that things will always stay the same. In September, I went on and on about serviceberries. They truly are a tree for all seasons with good blooms, good fruiting, and good fall color. I have four serviceberries in my garden. Looking back at November's post, I realize now how I discovered the garden writer Harriet Louise Keeler. I bought some of her books but I couldn't remember where I first read about her. You know I only buy books that I have a connection to. I'm sure glad I re-read that post. Now I feel less silly about buying Keeler's books. Which brings me to December. 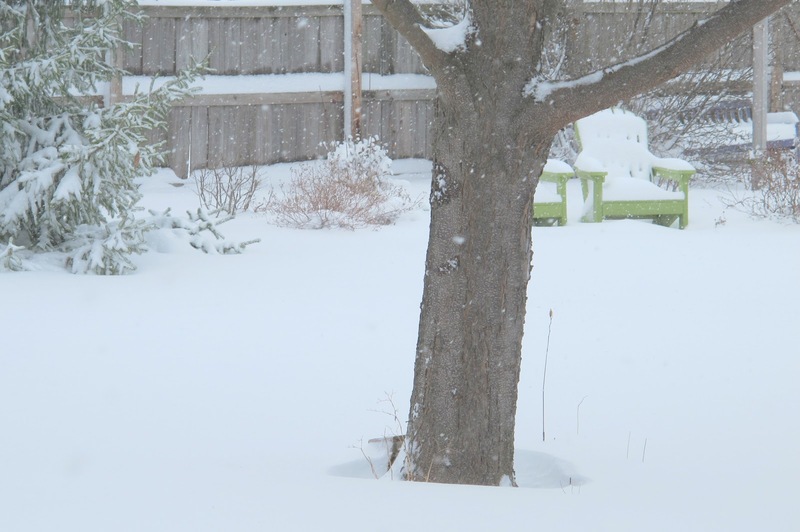 The picture above shows my garden under nearly a foot of snow, okay, really about nine inches of snow, which fell on my garden this morning during the blizzard. 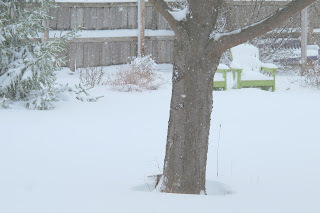 Nestled under all that snow are some of my wildflowers, waiting patiently for spring or summer or fall, whenever they bloom. They will inspire me to keep adding wildflowers to my garden, just as Gail does every fourth Wednesday on her blog, Clay and Limestone. I didn't post about wildflowers, or even review wildflowers. I am just admiring a good deep snow. We treasure every bit of winter preciptation. Serviceberries are lovely even in winter when there are no leaves at all. With the snow of the past two days, the crooks and crannies of the serviceberry twigs are holding lovely shapes of snowfall. And in spring they will be white again, but with blossoms. Have you eaten the serviceberries? My neighbor was thrilled to hear that serviceberries are known in Canada as "saskatoons", as he remembered his grandma's saskatoon pie. So, he was able to enjoy it once again. You have came up with a great recap of 2012 about your wild flowers.The wildflower season is one of the most fascinating and precious natural treasures.